Microscope World recently had a customer with the need to measure gold layers on printed circuit boards. The gold layers also needed to be measured. 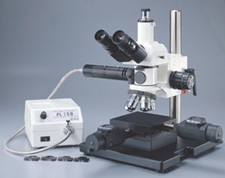 The microscope setup for solving this problem included the MC-70 measuring microscope with the DCC5.1P CCD microscope camera with advanced measuring software. Notice the two separate layers of gold captured in the above image. The above image was captured at 200x magnification and using the DCC5.1P camera with advanced software, in the middle of the image you will notice a small vertical red line that measured the thickness of the gold layer at 2mils. If you have questions regarding making measurements of layers please email us regarding your specific application.